(1) Well, I still can't believe The Blind Side is a best picture nominee, which makes me think about Julie & Julia is not a best picture nominee...(2)which makes me think that Sandra Bullock is heading into the Oscars in the lead, and that Meryl Streep will not get her third win. Speaking of which, and it probably warrants a full post, (3) but Meryl's last time to be in a film that even got nominated for best picture was 11 nominations ago for the 1985 film Out of Africa. Perhaps if Meryl Streep wasn't such a one woman show in films without full-package traction. Other things I like about Osnomo today was (4) that The Hurt Locker was able to match Avatar in Oscar nominations...9 each. I really would love to see The Hurt Locker be the film that wins at the Oscars this year, and (5) I have this feeling that the longer people are away from The Hurt Locker the more they like it, and the longer they're away from Avatar the more it looses it's IMAX 3D glowing blue cat-people appeal. Go Kathryn Bigelow. 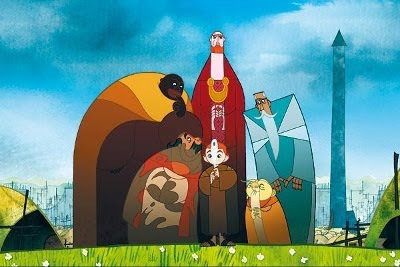 Pictured above is one of (6) the biggest surprises of the day for me, The Secret of The Kells. Nominated for best animated feature alongside Fantastic Mr. Fox, Up, Coraline, and the Princess and the Frog. That means it passed over more popular films like 9, Cloudy with a Chance of Meatballs, Ponyo, Ice Age, Monsters Vs. Aliens. That's right, this little Irish film passed up the otheres. I haven't seen it, but I want to now. Isn't that part of what awards are about? (7) Early in the year I thought Nine, Invictus, and The Lovely Bones were the films to beat...definitly not the case, although somehow Nine still managed to get 4 nods. [Invictus 2, The Lovely Bones 1]. (8) I'm glad to see Nick Hornby's now an Oscar nominee for An Education. (9) Sad to see no nod for Alfred Molina or directing for An Education. How did (10) The Young Victoria get nominated for Best Make-up? In a 10 Field Best picture race surprised to see (11) one film in the adapted screenplay race, In the Loop, and one film from the original screenplay race, The Messenger, without a picture nod. I wasn't sure how that was going to play out. (12) Of the three films with the most nominations Avatar, Hurt Locker & Inglourious Basterds two films came out in the summer, during during the award season glut. Think about that studios. Let's spread out the love.